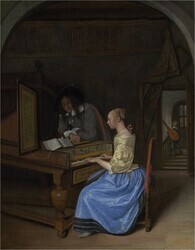 Jennifer Henel , Striking the Right Chord: Seeing Music in Dutch Genre Painting , National Gallery of Art, https://purl.org/nga/documents/literature/essays/striking-the-right-chord-seeing-music-in-dutch-genre-painting (accessed Apr 24, 2019). This painting’s theme echoes a sentiment expressed in the emblem “Who does not feel love?” (Quid non sentit amor? ), found in Jacob Cats’s celebrated book of emblems Sinne- en minnebeelden (1618). Above this emblem is the adage “A man tunes two lutes: as he tunes one, the strings of the other begin to vibrate in unison, suggesting lovers’ hearts beating in tandem.” Marjorie Wieseman, Vermeer and Music: The Art of Love and Leisure (The National Gallery, London, 2013), 26. Paraphrased and translated from Karel van Mander’s Het Schilder-boek in Marjorie Wieseman, Vermeer and Music: The Art of Love and Leisure (The National Gallery, London, 2013), 10. Harmony, his dictum suggests, is found in the mechanics—or color and shape—of the composition, not just in the image itself. In approximately 370 BC, Plato wrote Timaeus, stating that the “soul of the world is described as having these same musical ratios” and defining the initial concept of the sensory overlap, as well as the link with the spiritual world. Additionally, Aristotle, in 350 BC, related that the harmony of colors was much like the harmony of sounds, presenting a foundation for what would later emerge in the 1600s and beyond as correlation charts that married certain musical notes, devised by the Greek system of octaves (eight-note intervals), with a “like” color. Various discourses and treatises were written on these color tables. See Sean Day, “A Brief History of Synaesthesia and Music,” ThereminVox: Art, Technology and Gesture, February 21, 2001, http://www.thereminvox.com/article/articleview/33/5/5/. 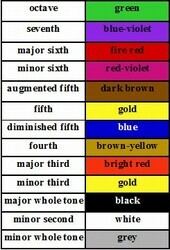 Robert Fludd, a 17th-century British scholar, also created a color chart based on Aristotle’s concepts. For more information, see Colorsystem: Colour Order Systems in Art and Science, http://www.colorsystem.com/?page_id=659&lang=en, adapted from Narciso Silvestrini, Ideefarbe (Zurich, 1994). See Penelope Gouk’s helpful chapter “Making Music, Making Knowledge: The Harmonious Universe of Athanasius Kircher,” in The Great Art of Knowing: The Baroque Encyclopedia of Athanasius Kircher, ed. Daniel Stolzenberg (Stanford, 2001), 71–83, in particular 74. Kircher’s articulation of the multisensory relationship between color and music resonates with Van Mander’s advice for artists and suggests that the experience of looking at painting may engage viewers on a variety of sensory levels. For synesthetes, the integration of certain colors and shapes on an artist’s panel or canvas may stimulate a musical experience, which would allow them to “hear” the painting. For most viewers, a painting’s composition reinforces the subject matter. 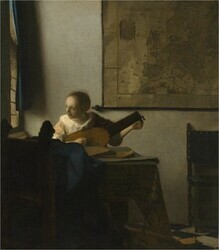 In Vermeer’s Woman with a Lute, for example, which is largely a cool, dark painting, accents of warm light on the upper left of the wall (promoted by whites and creams) direct our attention to the woman’s face [fig. 3] [fig. 3] Johannes Vermeer, A Woman with a Lute, c. 1663–1664, oil on canvas, The Metropolitan Museum of Art, New York, Bequest of Collis P. Huntington, 1900, 25.110.24. © 2017 The Metropolitan Museum of Art/Art Resource/Scala, Florence. Viewers are drawn in by the painting’s composition and color, while the lady tuning the lute provides the aural suggestion of harmony and balance. Listen, for example, to Huygens Duo, “Klare, wat heeft er uw hartje verlept,” March 17, 2014, video, 1:47, https://www.youtube.com/watch?v=AupH0G9ofhs&pbjreload=10 (accessed September 12, 2017). This musical piece, composed by R. Merckaert, would have been a likely soundtrack to the lives of the subjects of these paintings, as well as the viewers of these intriguing scenes. 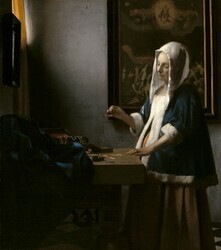 Paintings need not depict music to convey musicality, as evident in even the quietest of scenes, such as Vermeer’s Woman Holding a Balance [fig. 4] [fig. 4] Johannes Vermeer, Woman Holding a Balance, c. 1664, oil on canvas, National Gallery of Art, Washington, Widener Collection, 1942.9.97. While the subject matter and palette of this sublime painting imbue a sense of silence, a synesthete might hear major chords in the warm tones of the uppermost left, minor chords repeated in the rhythmic folds of dark blue cloth, an end refrain in the diagonal of the lady’s arm, and a major resolve in the narrow, vertical strip of the warm, creamy wall. The visual harmony created by these Dutch artists transcends their subjects and creates a transformative experience that entwines the senses as one looks and listens to a work. I would like to thank Arthur Wheelock and Alexandra Libby for their thoughtful comments on this essay. Paraphrased and translated from Karel van Mander’s Het Schilder-boek in Marjorie Wieseman, Vermeer and Music: The Art of Love and Leisure (The National Gallery, London, 2013), 10. From Sean A. Day, “Synesthesia,” http://www.daysyn.com/Definition.html. Though this term was not named by scholars until the 19th century, its foundations spanned centuries. From “Athanasius Kircher,” ThereminVox: Art, Technology and Gesture, February 4, 2004, http://www.thereminvox.com/article/articleview/77/1/16/. According to the findings in Ward’s study, Western synesthetes “read” and “hear” a painting from left to right and top to bottom, whereas Eastern synesthetes move right to left. See Jamie Ward, “Synestheisa,”Annual Review of Psychology 64 (January 2013), 49–75, https://doi.org/10.1146/annurev-psych-113011-143840.